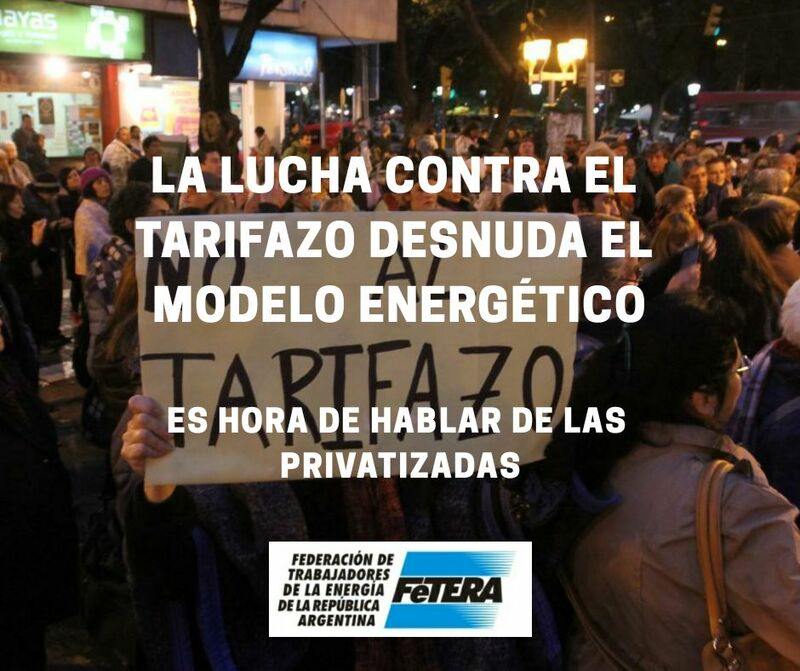 In Argentina there is a lot of talk about utility prices and subsidies, but very little is being said about privatized companies, their profits and whether we want them to continue to make huge profits out of the management of public services, as well as speculating with our lives. As we know, the Government has implemented a brutal rate hike for the benefit of privatized companies which hits not only workers and their families, but also pensioners. It directly attacks the middle class, destroys the poor’s daily life and further marginalizes those already sidelined. A people cannot tolerate that in a few months there be an increase in electricity prices by 1,600%, in gas by 1,300% and in water by 660%, because these are vital elements for modern life and people’s dignity. For all this, the battle against rate hikes is fundamental and from the FeTERA, the CTA Autónoma and the Union of Luz y Fuerza de Mar del Plata, we have been denouncing for some time these price increases; because they are brutal and only generate more poverty. The rate hikes are a scam to the people. And so, we have called for and participated in initiatives such as the recent Ruidazo and the March of Candles and we will continue to do it. We are part of the people’s rejection to the rate hikes because we believe that these are fundamental struggles. But we also understand that the debate should not stop there, since the subject of the rate hikes actually reveals a lot of other things. It is necessary to discuss the energy model, dominated by few private and foreign companies that profit from the basic needs of the population. The fight against price hikes must be urgently incorporated, and in a substantial way, to the conception that energy is a human right. Energy is not just any merchandise that can be found at the supermarket and people just gets upset when is more expensive. Energy is a social good and all states and governments must guarantee access to it. Energy as a human right has to be as important as public health is, or as education is, or as any other social right of any country is. This energy model is the continuity of one of the biggest scams that we suffer as a people: the privatization of energy companies such as YPF, Gas del Estado and all those that in the ‘90s were given to large capitals. We need to recall history to measure how big this scam is, scam which has to be added to another big fraud like the external debt. What would happen if to the fight against rate hikes we add the struggle against this energy model in which private companies do million dollar businesses with a human right? What would happen if to the fight against price hikes we add the debate about the profit rate of private companies? Why do they have to earn millions and millions of dollars and turn the people’s right to energy, which is a human right, into a business? As workers, social movements and as a people in general, we have to start discussing how much a company that offers a public service which is a human right, makes. We have to discuss who should be managing the companies extracting oil, or gas, or the ones generating renewable energy, as well as those who transport and distribute energy. All that chain is in the hands of business people who speculate with a human right. They speculate with our lives. All these companies are in the hands of business people and foreign capitals which from some office in London, New York or some other emblematic city, decide on our energy, on our lives. Do we want these speculators (misnamed “investors” or “international capitals”) to have in their hands something that is strategic for the country and something as vital to life as energy? For all this, we believe that these price increases are actually a symptom of something else. And, from our humble place and role as the Federation of Energy Workers and its unions and as the CTA Autónoma, we see that it is necessary and urgent that the battle against the rate hikes incorporates the struggle against the model of foreignization and privatization of energy because we understand that one battle cannot be fought without the other. 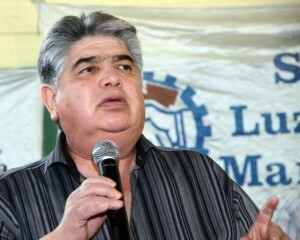 José Rigane*, General Secretary of FeTERA and Luz y Fuerza de Mar del Plata, and Deputy Secretary of CTA Autónoma.